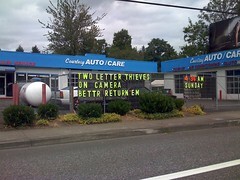 Someone stole some letters from the Courtesy Autocare Sign. Please bring them back. We like the sign! I like the BETTR Internet contraction. Maybe they didn't have enough Es left? or ride the bus past the sign most days. The sign is located here (via mapquest). Here is a cool link to Flash Earth which gives a satellite image of the sign!